Lord Leo Byron, is bored lately with society and needs something or…someone to liven up his life. And then he meets Lady Thalia Lennox a woman that refuses his interests at every turn. But her refusal to give him the time of day only intrigues him even more and loves a good chase of his “prey”. Thalia has had enough of being embarrassed and mocked and ridiculed and the last thing she wants to do is give another man a reason to humiliate her. Thalia married a man she didn’t truly care for but did so out of duty. But her husband treated her awfully through their marriage and trapped her in a situation where she now bears the brunt of being a divorced wife. Just about everyone she ever knew and loved turned their backs on her except for a couple of friends. She doesn’t trust Leo further than she throw him. She realizes there may be more Leo than she first assumed. But her ex-husband made sure she could never find the happiness she and Leo deserves. Leo Bryon, is part of a big family and is also a “twin”. Leo hides behind th facade of being charming and easy going and full of laughter to hide his true intelligence. With all of his siblings highly gifted in the brain department, Leo wanted to be able to stand out from the ‘crowd’. Leo isn’t as superficial as he makes himself out to be. He is very close to his twin and they tend to get into all sorts of trouble together. Leo was such a wonderful hero especially once his feelings for Thalia turned deeper than physical desire. I truly couldn’t get enough of seeing how devoted he was to Thalia. Thalia is forced to live away from the Ton, since the actions of her ex-husband forced her into exile. Thalia did no wrong, but her ex-husband is a very vindictive and bitter man and takes it out on her at every turn. Thalia despite what she has lost, has managed to maintain a manageable living. Thalia has such a strong and resilient spirit. I loved her inner strength and fortitude to keep going strong even when others were always batting her down. I had so much admiration for Thalia, and love the way she grows in this story and the way we see how feisty she can be and seeing how after all she suffers, she still remains stronger than ever. The Bedding Proposal was fun and entertaining but also a bitter sweet read for me. Reading about situations like what Thalia goes through can be really hard to read at times. It’s one of the draw backs of reading Regency Era romances. Mostly because it can be difficult to read about what women had to go through especially when it came to rights and privileges they had which was very few. But what was also simply wonderful about this story too was seeing the strength of women especially back then. They had very few rights, but in this book especially we see how sometimes that only forges stronger and more resilient personalities in women. And Thalia is one of those women that didn’t break she was only made stronger. And I honestly loved seeing the slow changes in her as she experiences love for the first time with Leo. Leo, at first, views Thalia as a “prize”. But you soon realize that he is drawn to her for other reasons. I do want to be her friend, he realized. I want to discover everything there is to know about the beautiful, mysterious woman who is Lady Thalia Lennox. And once he falls for her, he like any rake, falls hard and doesn’t give up on her. I love the way he treats her, how much he is willing to do to give her a measure of peace and happiness that he knows she deserves. And the sweet devotion he has to her is so heart melting it might make you cry from it. Their romance is tender and poignant at times especially in the later half of the story. In the first half we see their quick-witted and fun bantering which is highly entertaining. But once they truly are honest with each other, that is where their relationship really soars. I just can’t wait for what Warren does next in this series. Its alright, I really like the way his shirt is part way open and the male model is exactly how you would picture Leo to look like too!! The Bedding Proposal has a witty and lighthearted fun beginning that develops into a heart-aching romance that tugs at your emotions and will utterly draw you in! A CAPTIVATING ROMANCE! I should never have come here tonight, Lady Thalia Lennox thought, as she forced herself not to flinch beneath the leering stare of Lord Teaksbury. She didn’t believe he had met her eyes once since they had begun conversing. Old lecher. How dare he stare at my breasts as if I’m some doxy selling her wares? Then again, after nearly six years of enduring such crude behavior from men of her acquaintance, one would think she would be well used to it by now. As for the ladies of the Ton, they generally looked through her, as if she were some transparent ghost who had drifted into their midst. Or worse, they pointedly turned their backs. She had grown inured to their snubs as well—for the most part, at least. Still, she had hoped tonight might prove different, since her host, the Marquess of Elmore, had known his own share of personal pain and tended to acquire friends of a more liberal and tolerant persuasion. But even here, people saw her not for the person she was, but for who they assumed her to be. Ordinarily, she tossed aside invitations such as the one for tonight’s supper party—not that she received all that many invitations these days. But she supposed the real reason she had come tonight was a simple enough one. Her two friends, Jane Frost and Mathilda Cathcart—the only ones out of all her acquaintance who had stuck by her after the divorce—were in the countryside. They had each invited her to join them at their separate estates, but she knew her attendance at the usual autumn house parties put each woman in an awkward and difficult position. Plus, neither of their husbands approved of their continued association with her, their friendship limited to occasional quiet meals when they were in Town, and the back-and-forth exchange of letters. No, she was quite alone and quite lonely. Ironic, she mused, considering the constant parade of lovers she supposedly entertained—at least according to the gossip mavens and scandal pages that still liked to prattle on about her. Given their reports of her behavior, one would imagine her town house door scarcely ever closed for all the men going in and out—or perhaps it was only her bedroom door that was always in need of oil for the hinges? She felt her fingers tighten against the glass of lemonade in her hand, wondering why she was dwelling on such unpleasantness tonight. Better to put thoughts like those aside, since they did nothing but leave the bitter taste of regret in her mouth. A hot bath and a good book, that’s what I need this evening, she decided. That, and to tell the old reprobate still leering at her to take his eyes and his person somewhere else. If only she hadn’t given in to the temptation to wear emerald green tonight, perhaps she wouldn’t have ended up being ogled by a loathsome toad like Teaksbury. But she’d always loved this dress, which had been languishing in the back of her wardrobe for ages. And honestly she was tired of being condemned no matter what she wore or how she behaved. In for a penny, in for a pound, she’d thought when she made the selection. Now, however, she wished she’d stuck to her usual somber dark blue or black, no matter how dreary those shades might seem. Ah well, I shall be leaving shortly, so what does it really matter? Teaksbury opened his mouth—no doubt to assure her that he didn’t mind in the least. But she had already set down her glass, turned on a flourish of emerald skirts and started toward the door. She made it about a quarter of the length of the room when a tall figure stepped suddenly into her path, blocking her exit. She gazed up, then up again, into a boldly masculine face and a pair of green-gold eyes that literally stole her breath. The man sent her a dashing, straight-toothed smile, candlelight glinting off the burnished golden brown of his casually brushed hair in a way that only increased his appeal. Saints above, she thought, as her heart knocked hard inside her chest, her pulse leaping as it hadn’t leapt in years—if it ever had at all. Schooling her features so they revealed none of her inner turmoil, she gave him a polite nod. “Pardon me, sir.” She waited, expecting him to step aside. Arrogant, isn’t he? Well, she’d met arrogant men before, many times. She took a step to the right. Reaching toward the tray of a passing servant, he picked up two glasses. “Champagne?” he offered. Smiling that devastating smile again, he held out one of the crystal flutes with its golden draught effervescing inside. Audacious as well as arrogant. That and handsome in a sinful way no man had a right to be. She didn’t know whether to be annoyed or amused, particularly since she was sure part of his strategy in waylaying her was to provoke a strong reaction. Still, she found herself accepting one of the proffered glasses, if for no other reason than to give herself time to steady her nerves. The wine suddenly turned sour on her tongue. He’d been embroiled in scandals, had he? Vaguely she remembered mention of various members of the Byron family involved in deeds that had shocked Society at one time or another. But none of their acts had made any of the Byrons outcasts. And being that Lord Leo was a man, the Ton was, of course, more apt to forgive, no matter how serious the trespasses might have been. As for his “over the years” remark, he didn’t look old enough to have weathered all that many scandals. In fact, just how old was he? Certainly not her own two-and-thirty, even if he had the confidence of a man in his prime. “Truly, I cannot,” she said. Her mouth dropped open before she could recall herself. Slowly, his gaze dipped down, moving gradually over her body in a way that felt almost like a caress. A hot flush burst over her skin, shocking her with its force. Only barely did she resist the urge to reach up and cover her hot cheeks with her hands. The sensation was truly singular considering she hadn’t blushed since her girlhood and her first London Season. Experienced women did not blush. Yet this outrageous lord with his heart-stopping smile and velvety voice roused emotions in her that she hadn’t realized she still possessed. All his bedmates, he meant, his meaning clear. Without even knowing what she intended, she flung the contents of her glass up into his face, champagne splashing everywhere. He blinked wine out of his eyes, a stunned expression on his wet face. Spinning around, she marched toward the door. As she did, she caught sight of a man standing across the room—a man she would have sworn was Leopold Byron had she not known he was still dripping somewhere behind her. Her step wobbled slightly as her mind worked to figure out the unexpected anomaly. Twins? Good God, are there two of him? And his brother was laughing, making no effort at all to contain his mirth. Well, let him laugh. Impudent beast, just like his sibling. As for the rest of the guests whose stares pierced her from all directions, she was used to such scrutiny. The entire incident would be in tomorrow’s papers, of course. But what do I care? Tossing champagne into a man’s face was nothing, not compared with what she’d been through already. For when you’ve known the worst, the rest was naught but a trifle. 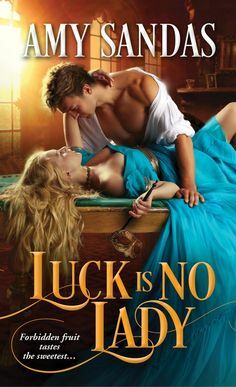 Tracy Anne Warren is the New York Times bestselling author of ten Regency historical romance novels, including At The Duke’s Pleasure and The Husband Trap. Her books have appeared on the USA Today Bestsellers’ list and the Borders’ Group List of Bestselling Single Title Romance Paperbacks. She has won numerous writing awards, including Romance Writers’ of America’s prestigious RITA® Award, the National Readers’ Choice Award, the HOLT Medallion, the Golden Quill, and others.